I just wanted to share a happy story about getting out of big-time debt. 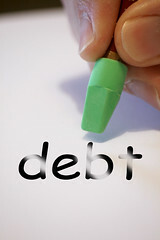 This afternoon, one of my dearest friends called and yelled into the phone, “WE’RE OUT OF DEBT! !” She had just sent off the last check for the balance of the last credit card. I told her she should call Dave Ramsey and give him the good news, too, because his books inspired her. It took 17 years for this family to get into and out of over $50,000 of debt one one credit card, but they did it, and without going into bankruptcy, which I remember was once a near-possibility. (There was some debt on a second credit card that was eliminated, too.) My friend’s story is pretty typical, but they don’t live in a fancy house or drive fancy cars. Quite the opposite, and they don’t even know what they have to show for all that credit card debt. No fancy kitchen, no addition to the house. No Lexus. So, how did they get into that mess? LITTLE THINGS ADD UP and they add up fast to $50,000, so just keep that in mind when pulling out that plastic. The lesson here: LITTLE THINGS ADD UP. Quite simply, this family got out of debt slowly, but surely, by putting every extra penny towards their debt. That included tax refunds and any extra money that came their way. They also stopped charging by, oh, I’d say 90%. There were those days where my friend would call and tell me she had to charge something, but the guilt was palpable. I believe it was the guilt that motivated this family to get debt-free. Now, the challenge, as she says, is to stay debt-free. I asked her what she was going to do with the credit card…cut it up? Freeze it? Lock it up? She wasn’t sure. Now comes the hardest part…maintenance!